Rejected at first by Disney, he became part of its "Dream Team"
How would Walt Disney have written a happy ending for this story? In 1959, a boy of six, growing up in a large Irish Catholic family in suburban Chicago, is so enchanted by the book Disney’s Art of Animation that he decides to become an animator. Fueling his dreams are films like the gorgeously designed Sleeping Beauty, which came out that year, and later, 101 Dalmatians and Pinocchio. At Loyola Academy in Wilmette, he hones his drawing skills with cartoons and caricatures for the student paper. 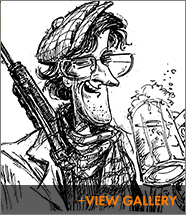 At Northwestern, he becomes a political cartoonist for the Daily Northwestern, still seeking to follow in the footsteps of the Nine Old Men, legendary animators who had made such classics as Snow White and the Seven Dwarfs. He sends his portfolio to Disney Studios. It is promptly rejected. So his career was over before it began? Not really. In fairy tales and sometimes in life, the hero encounters obstacles which can be overcome by persistence, courage, and heart. In Musker’s case, talent and fortuitous timing also played a part. Just as he was starting out, the California Institute of the Arts (CalArts) was beginning a program in animation, which came to serve as a farm team for Disney. In happily-ever-after fashion, after completing the CalArts program, Musker was hired by Disney, his animals presumably much more lifelike and frisky. And little more than a decade later, as half of its “dream team,” he was credited with helping usher in a new Golden Age of animated films for the studio. Musker and his collaborator, Ron Clements, directed The Little Mermaid (1989), a huge hit, and wrote, directed, and produced the even more successful Aladdin, which debuted in 1992. Yet there is drama in the animation business itself, peaks and valleys, misses as well as hits. Market forces and new technology can influence a film’s success as much as artistic merit. The public can be fickle, initially lukewarm to films which turn out to be classics. Musker’s personal story is far from finished just as the fate of hand-drawn animation itself lies in films yet to be screened. Much seems to hang in the balance with The Princess and the Frog, due out in December 2009. As of this writing, Musker and Clements are sparking each other’s creativity yet again, directing some 300 animators to tell the story of Disney’s first African American princess, Tiana. The film marks a rather momentous return to hand- drawn animation after the studio had abandoned that art form in favor of computer-generated imagery. During an interview at a pancake restaurant in Park Ridge recently—with his non-stop behind-the-scenes stories and trademark quips—Musker brought the art of animation to life almost as vividly as he has in films. He made it clear why he loves the business—“sitting in a darkened theater and having strangers actually laugh at my jokes and connect emotionally with the story.” He may not have met his hero, Walt Disney (who died in 1966, when John was just 13). But they share a gift for both drawing and storytelling, the key to getting an audience to delight in animals who talk and mermaids who grow legs. It was at Northwestern, he recalls, that his interest in becoming an animator was solidified. A day student, he made films with friend Rick Garofalo, now an engineer at WGN in Chicago, during both high school and college. Especially memorable, to Musker anyway, was A Long Summer’s Dream, a Super 8 feature length film that took the pair three years to complete. About a kid looking for romance and a job, the hapless star was chased by criminals and assisted by a Frank Capra-esque guardian angel. If that was his “film school,” his lessons in literary storytelling came during classes as an English major. “Elizabeth Dipple’s class made Shakespeare come alive for me, dramas with real people and emotions,” he says. Alfred Appel’s Nabokov class revealed to him the story beneath the story, “the literal story and the playful subtext as well.” He remembers the power of Dostoevsky’s fiction made tangible by Irwin Weil. In another instance of serendipitous timing, an “Animation Feast” attracted 500 people to Northwestern in 1974. The keynote talk was delivered by Chuck Jones, the Warner Brothers animator and director famous for Bugs Bunny, Daffy Duck, Porky Pig, and the Road Runner cartoons. Jones deeply impressed the young Musker, making a career in animation seem both feasible and exciting. Still, the commercial success of The Jungle Book (1967) and The Rescuers (1977) created a window of opportunity for animators. Disney instituted an in-house training program to replace the animation veterans nearing retirement. The studio eagerly sought those being trained by CalArts: along with Musker, these included Rob Minkoff, who went on to co-direct The Lion King, John Lasseter, Pixar’s dynamo who later came to Disney, Brad Bird, Tim Burton, and many others. This young bunch shared a passion for animation and formed a sort of L.A. family for Musker, now far from his Chicago home. The animator met his wife, Gale, then a Disney librarian (they now have three children). He also found his creative partner, Clements, and they worked together on The Fox and the Hound in 1981. But by 1984, the animated film business was looking grim. Disney’s new management wondered if they should shut the expensive, labor-intensive business down. The Black Cauldron, an interim film that featured neither the work of the Nine Old Men nor that of the younger group just arriving, flopped in 1985, with critics calling it violent and (even worse for a film) insufficiently entertaining. Musker and Clements’s directorial debut in 1986, The Great Mouse Detective, was a moderate success. But it was a mermaid who swam into view a few years later and breathed life into a languishing art form. “Ron had found a book of fairy tales by Hans Christian Andersen, read the story and thought, ‘Why hasn’t Disney done this?’” says Musker of the film’s genesis. “When he got to the really sad ending, he knew.” (The mermaid is told to kill the prince or die. When she doesn’t, she turns into sea foam.) So Clements wrote a two page outline of a new approach to the story, which eventually got the green light and moved into production. Collaboration with other artists is, in fact, one of the best parts of working in animation for Musker. Characters often start out one way and evolve into something quite different once creative talents are pooled. Who knew that a cross-dresser and a soft-drink icon would inspire two of Mermaid’s most memorable characters? The sea-witch Ursula was originally conceived as an aging fashion model in the form of a lionfish with dangerous spikes. But one of the artists made her a heavyset blond with ponytail, reminiscent of the drag queen Divine, and that’s the idea that stuck. The film was the last hand-drawn animated feature made the old-fashioned way: animating the drawings, shooting them under a camera, and hand-painting the cels—essentially the same process used in Snow White in 1939. Since Mermaid, the studio has used a computerized system in which characters and backgrounds are still hand-drawn but the images are colored electronically and then scanned directly onto film stock, eliminating the use of cels. It took three years to make The Little Mermaid, and, during the process, the creative team had no idea whether it would be a success. Among the headaches were the bubbles. The undersea setting calls for hundreds of thousands of hand-drawn bubbles and it was cheaper to outsource them to China. Then came the Tiananmen Square massacre and, in the clampdown, the drawings were stuck on a boat the creators feared would never leave China. In the end, the boat sailed, the film was completed, and audiences loved it—adults as well as children. Like Snow White and Cinderella, it had the formula of a beautiful heroine, a handsome prince, and a dastardly villain. But the mermaid was a more modern heroine than the others; her actions drove the story. The film also had quicker pace for children weaned on video games and an irreverent sense of humor, not unlike that of Musker and Clements themselves. But Musker made it clear they have found no sure formula for success. Interspersed with the films which have made him a legend are a break-even film, Hercules in 1997, and the critically well-received but financially unsuccessful Treasure Planet in 2002. The latter is a science fiction version of Robert Louis Stevenson’s Treasure Island, with outer space as the setting. The animated film business had changed during the interlude between Mermaid and Treasure Planet. Anything which smacked of being “too Disney” was out of favor—even at Disney. Hits such as Mermaid, Aladdin, and Beauty and the Beast had driven up the salaries of animators and, consequently, the cost of making hand-drawn films. In 1995, the first fully computer-generated feature film, Disney/Pixar’s Toy Story, was a resounding commercial success and animation companies began to make a transition from traditional animation to computer-generated. Michael Eisner, then Disney’s CEO, decided to pull the plug on what was once the company’s very identity. Then, their contracts up, they actually left the studio. But within six months, Eisner was forced out and John Lasseter, Musker’s friend from CalArts days, came to Disney and convinced the pair to return. New management sees merit in both kinds of animated film and so does Musker. “Computer generation is very good at creating three-dimensional worlds that feel like you could walk into them,” he explains. “But the computer likes perfection and humans tend to look like mannequins and robots. With hand-drawn animation, it’s easier to get warmth and expression.” Musker and Clements successfully pitched their hand-drawn version of The Princess and the Frog, then went to New Orleans to research its setting. The new story will be a romance, enlivened with a plucky heroine and the music of Randy Newman. Musker says he is thrilled to be giving a whole new crop of animators a chance to break into the business, as he once did. Does the future contain another happy ending for John ‘n’ Ron and their beloved art form? With The Princess and the Frog, the answer is coming next December to a theater near you.